HORAN Capital Advisors Blog: Are Emerging Markets The Trade Of The Decade? Are Emerging Markets The Trade Of The Decade? "Many investors mistake a bear market for diminished prospective returns. From the rear-view mirror, the bear market in emerging markets has been painful. When we look out of the windshield, however, these very asset classes offer the highest potential returns (as of 12/31/2015 their 10-year expected return is 7.9%) available to today’s opportunistic investor. So, the exodus from emerging markets is a wonderful opportunity – and quite possibly the trade of a decade – for the long-term investor." 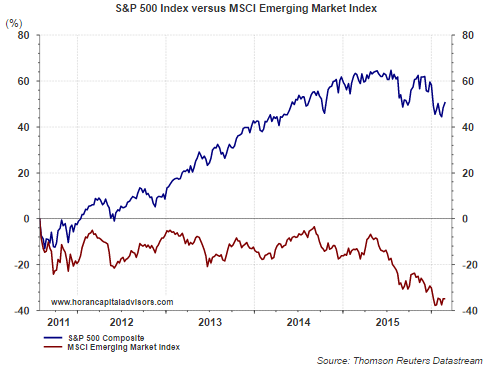 Certainly, the below chart shows the underperformance of the MSCI Emerging Markets Index versus the S&P 500 Index. 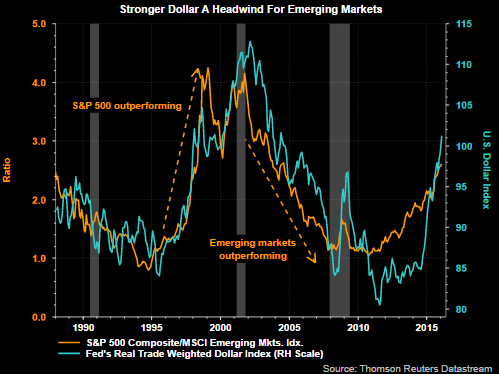 For investors interested in increasing emerging market exposure, they will want to evaluate the potential impact of further US Dollar strength due to the negative impact a strong Dollar has on emerging market performance. Historically, Dollar strengthening moves have trended in a 7-year cycle. As the below chart shows, the most recent Dollar move has been running for about four and a half years. If the seven year pattern holds, continued weakness in emerging market performance may persist. Admittedly, a lot of the Dollar strengthening move has occurred; however, with the Fed interested in continuing to normalize interest rates, higher U.S. rates would likely provide some tailwind for additional Dollar strength.